Life Is Strange 2’s announcement trailer wasn’t particularly inspiring, but this 20 minute gameplay reveal is much better. It sets up the story for the brand new game, which will see Sean and Daniel Diaz on the run. DONTNOD definitely hasn’t lost its touch, as this opening is filled with awkward teenage exchanges – and some of the finest indie music you’ll find this side of a hipster’s Spotify favourites. The first episode’s due out on 27th September, and if you’re already sold on the sequel, then we’d recommend skipping this video because it does show off the entire opening of the game. If, like us, you weren’t overly enamoured with yesterday’s reveal, though, know that this is a much better look at the new title. Yep, that's some Life Is Strange. I'm in again. Agreed, this looks a lot better. I still need to play the original. Everyone needs more story-driven experiences in their lives. I think it’s much more constructive than listening to people cuss each other out in deathmatches! Shut up and take my money now! I played Life is Strange all the way through in one play through it was so good. Ok it does look better than what I saw yesterday...maybe? There will still be complaints that the dialogue in the game is corny/cheesy or whatever, though. I'm pretty much calling it now. It looks great, but sound design in this gameplay is awful. Very unnatural flow of conversations and sound design, feels like it was read from a paper. EDIT: compared it with Captain Spirit, and it's definitely less good sound-wise. 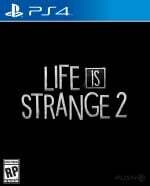 Hopefully this one leaves me an emotional wreck like the first Life Is Strange game, cant wait! @GKO900 That's why I'll get it when all the episodes are available together. funny how dontnod is now the market leader in episodic narrative driven games... telltale burned a fuse and has never recovered. Omg this was an amazing gameplay, the ending blew me away and is still lingering on my brain. I may not preorder but definitely buying the complete collection down the line. It will be next to impossible but ill try to wait until all eps are out before starting it. Very excited!